German scientists have created DNA-driven robotic system that is hundreds of thousands of times faster than anything else in its field by powering a self-assembling DNA nanorobotic arm with electric fields. DNA origami has emerged as a powerful tool to build precise structures. But now, “Kopperger et al. 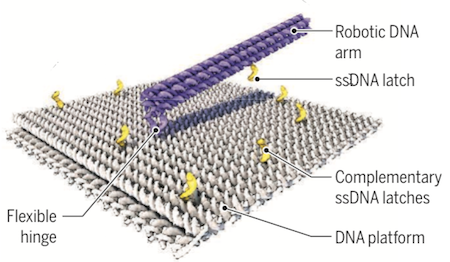 make an impressive stride in this direction by creating a dynamic DNA origami structure that they can directly control from the macroscale with easily tunable electric fields—similar to a remote-controlled robot,” notes Björn Högberg of Karolinska Institutet. The cylinder had split. At first he couldn't tell if it had been the impact or deliberate internal mechanisms at work. From the rent, an ooze of metal bits was sliding. Squatting down, O'Neill examined them. The bits were in motion. Microscopic machinery, smaller than ants, smaller than pins, working energetically, purposefully - constructing something that looked like a tiny rectangle of steel. "They're building," O'Neill said, awed.